Today is National Chocolate Chip Day. Want to spice up your life today? Why not add some chocolate chips to your day! Add some to your favorite dessert, over ice cream or perhaps simply pair some with a pint of rich creamy stout. A bit of chocolate today will help you get over the hump. Here's what's happening around the Colorado beerosphere today Wednesday, May 15th, 2013. Hops & Pie (Denver) - How do you celebrate American Craft Beer Week today? With $2 Craft Cans tonight from 5pm to close. Crooked Stave Artisan Beer Project (Denver) - Crooked Stave fans in Fort Collins! Go join Kyle at Tap n Handle in FoCo tonight at 6pm for a Crooked Stave mini tap-takeover. He will be pouring St. Bretta - Spring, Vieille Artisanal Saison, and their recently packaged Hop Savant dry hopped with experimental hop 344! The first 6 people to order all three receive a Crooked Stave logo tulip glass! He'll also be giving out stickers, smiles and high fives all night! Denver Beer Co (Denver) - Don't Forget! Join Denver Beer Company this Friday, May 17th for their Spring Beer Dinner in their Barrel Room. Details and tickets at the taproom! The Brew on Broadway (Englewood) - Englewood's newest brewery is opening very soon! They plan to start brewing their first batches any day now. They will announce their official opening day at that time. Their beautiful wood floors are just waiting for you! Burning Can (Lyons) - This year's Burning Can festival takes place on Saturday, June 1st at Bohn Park in Lyons, CO and featured ONLY canned craft beer. Festival hours are 4-7pm for General admission and 3-7pm for VIP. Tickets are available now at: www.burningcan.com. Burning Can takes place during the Lyons Outdoor Games which run from May 31st through June 2nd. Over 3 dozen canning breweries are expected to participate. Twisted Pine (Boulder) - Tomorrow, Thursday, May 16th - Twisted Pine will be hosting a Nationwide Toast for American Craft Beer Week at 6pm Mountain time. Join in for a FREE sampler toast. Upslope Brewing (Boulder) - This Friday evening (May 17th) at 7pm, Upslope will be host to the Boulder Premiere of the documentary film "Crafting A Nation" at their new Flatiron Park location (not the Lee Hill one). This is a follow up film to "Beer Culture" and takes a look at the national craft beer scene. Tickets are available on Eventbrite for this 95 minute film. Tickets are also available in the tap room. Have a brew and watch a great craft beer movie. FATE Brewing (Boulder) - FATE Brewing Company will release eleven of its twelve collaboration beers on Sunday, May 19th, 2013, just in time to toast American Craft Beer Week. Head brewer, Jeff Griffith, teamed up with many Boulder County breweries to stack hands on a variety of unique recipes. FATE will be offering the following collaboration brews: Echo Brewing Company (Eisbock), Crystal Springs Brewing Company (Wee Heavy Scotch Ale), Asher Brewing Company (100% Organic Cocoa Punk'n Porter), Wild Woods Brewing Company (Eastside Extra Pale Ale), Shine Restaurant and Gathering Place (Let Your Fate Shine Imperial IPA), Boulder Beer (English Brown Mild), Twisted Pine Brewing Company (Twist of FATE Rye Brown Ale), Mountain Sun/Southern Sun Pub & Brewery (Cherry FATE, Chocolate Cherry Foreign Stout), Big Choice Brewing Company (Biere de Garde), Lone Tree Brewing Company (Schwarzbier), Bru Handbuilt Ales and Eats (Trippel), and Twelve Degree Brewing (Hommelbier). Patrick's Irish Pub (Greeley) - Starting tonight you can get some wood fired pizzas from Peach Pit Pizza right outside of Patrick's Irish Pub. Every Wednesday at 5pm the Peace Pit truck will be parked out front with food to pair with the 31+ taps at Patrick's. Plus, tonight is Open Mic night starting at 9:30pm. Come share your talent. High Hops Brewery (Windsor) - Today's Wednesday (Humpday) Firkin is a Lemon Ginger Honey ale. It's the perfect drink for sitting on the patio and watching the Spring sunset. it taps at 5pm. Black Bottle Brewery (Ft. Collins) - Just tapped today! Stop in for taste of their Sour Diesel - it's a sour porter that was brewed with Black Berries and aged in Maker's Mark barrels. It's a 6.3% sour wonder just for American Craft Beer Week! Mayor of Old Town (Ft. Collins) - Join Funkwerks co-founder Brad Lincoln at The Mayor of Old Town tonight (May 15th) from 6pm-9pm for their Keeping it Classy cigar and pipe smoking night featuring our collaboration Belgian-style Dubbel, Son of Nothing! Remember, it's American Craft Beer Week-- so go enjoy some craft beer! Front Range Rally (Loveland) In 3 days (May 18th 3-7pm) over 32 breweries and nearly 15 food truck will gather outside at the Loveland Food Bank for a festival benefiting Food Bank of Larimer County. Tickets are still available at www.frontrangerally.org. 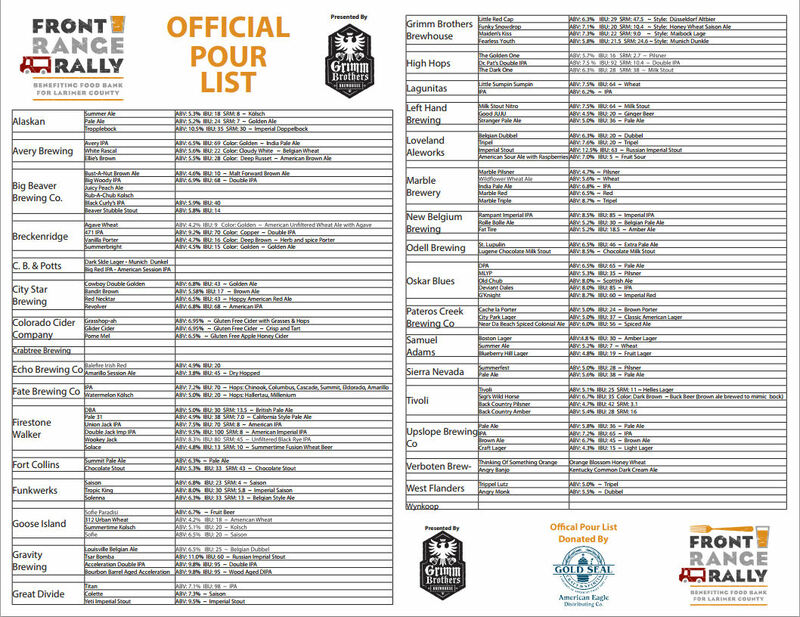 The beer list has been released and there will be some special beers included in the line-up that you won't want to miss. Come hungry as there will be plenty of food available to fill you up. 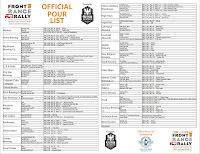 Click the image to get the full beer menu. Also expecting beers from Crabtree, Boulder Beer and Wynkoop to be added soon. Attendees will be given a beer list at the gate. Loveland Aleworks (Loveland) - What's coming down the pipelines at Loveland Aleworks? Just today they brewed up some Zach's Imperial IPA and are starting on a Black IPA. Look for these batches soon to be on tap! Grimm Brothers Brewhouse (Loveland) - If today is Wednesday, then it must be Open Mic Night! Bring your talent to the taproom and earn a free pint. The show starts at 6:00pm, but the beers will be flowing all night til close. Also, tonight at the new Alama Drafthouse Cinema in Littleton, join Grimm Brothers for brewers night followed by a Star Trek Double Feature that ends with a showing of the new film "Star Trek Into Darkness". Get there by 5:30pm! Like us on Facebook - There's even more Colorado beer happenings and discussions on the Fermentedly Challenged Facebook Page. Find recaps, special offers, and tips that you won't find on the blog. "Like" us and get even more soon after it happens. Thanks for helping us grow to over 1700+ "Likes" in 2013!